Amazing video about a 'cable repair guy'... in a helicopter. Brave is not the absence of fear, but the capacity to carry in it's presence! I don't know why, but this moved me to tears. It's actually quite beautiful and wonderous. I wish we could see the man who is talking. Awesome! Thanks for sharing this one! I would like to do this but only once. Those guys are full of energy... half million volts are something. If he could carry a bulb in his hand that would light on? Could someone please explain what he is doing to repair the power lines? Wow. They must really pay him a lot of money. lol hes afraid of electricity, height, and women. so does that mean the pilot is a girl? i thought it was funny how hes said its as safe as crossing a street...LA streets? 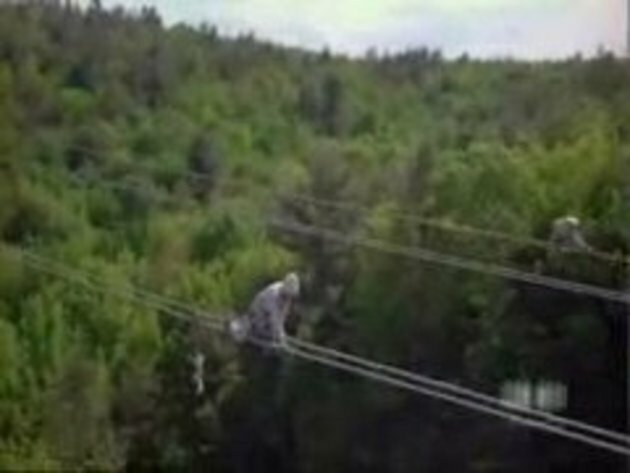 #7 He said there is such a high demand for electricity that nobody wants to take down a powerline to maintain it. So what he is doing is maintaining it, checking for problems and defects. #3 i agree he has a very tranquil voice, you just get relaxed by hearing him talk... his job is insane, lots of respect!! My husband use to do this. The answer to questions as best as I can answer is.....#7 is changing spacers. It's to keep the 4 cable from touching each other. sometime the spacers will break and have to be changed. answer to #11 is not take down the power-Line but to take down (out) power from the line. If they did that thousand or millions of people would be out of power (these lines supply power to the small distribution lines, then they supply power to small line that feed into your homes). These guys have a very skilled job and the pilot has to be VERY good also, kudos to them! for making life safe. I remember seeing this before somewhere, one of the most dangerous parts of is the landing.... they need to safely ground/earth the chopper before it can land! I used to paint electical towers. 3 rules we used to stay alive. 1. Know where you are every second. 2. Know where you are going before you make a move. and the best one 3. Never take anything for granted. Oh, and I wonder if the guys great voice was allways like that, or did the voltage do it... Just kidding. does he like it or is he doing it for the money?